Pause: 30 minutes between 12.00 and 1.00 p.m. Permanent exhibition about the history of the New Town and panoramic Prague in the tower keeper´s apartment. 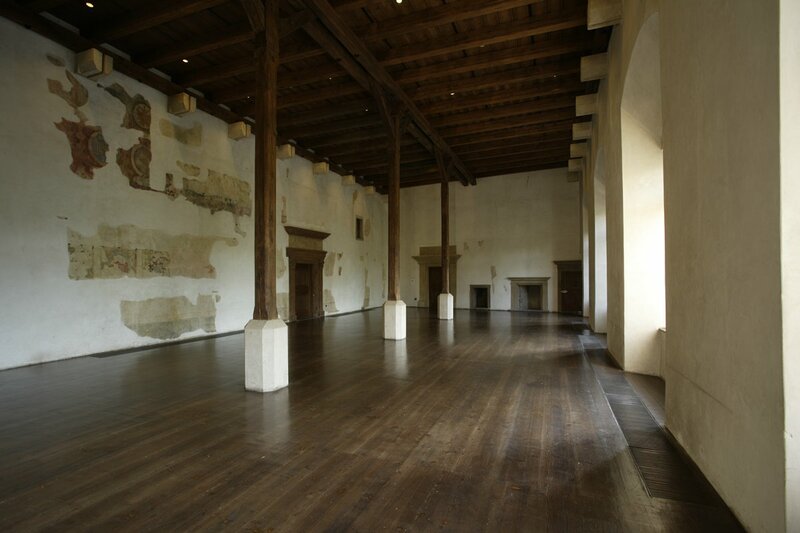 Gallery in the tower - short-term exhibitions. 221 steps lead to the top, no lift. Entrance from Vodičkova Street. 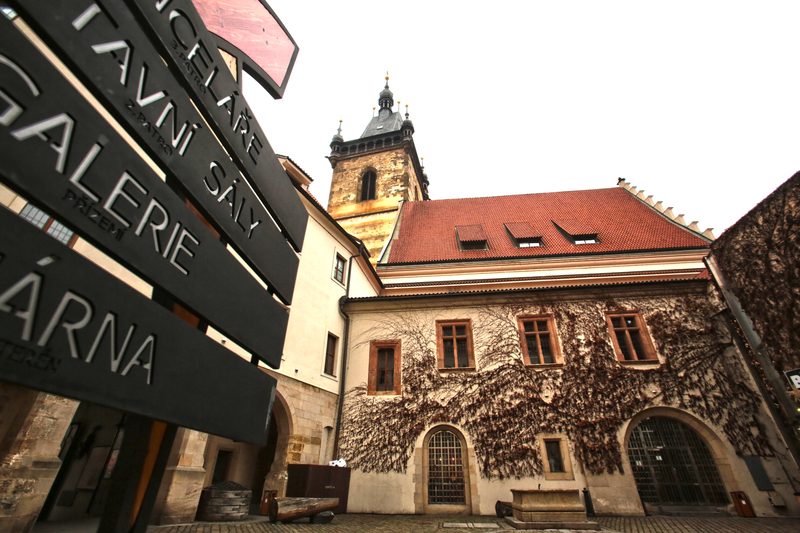 Town Hall Pass - Visit Prague’s two oldest town halls, with no waiting in line! The Town Hall Pass is the cheapest ticket for a tour of Prague’s historical town halls. The combined ticket covers going up the New Town Hall tower, entry to the Old Town Hall historical interiors and two trips up to its own tower viewing gallery. The Town Hall Pass is valid for 3 days and is on sale at the Old and New Town Halls. 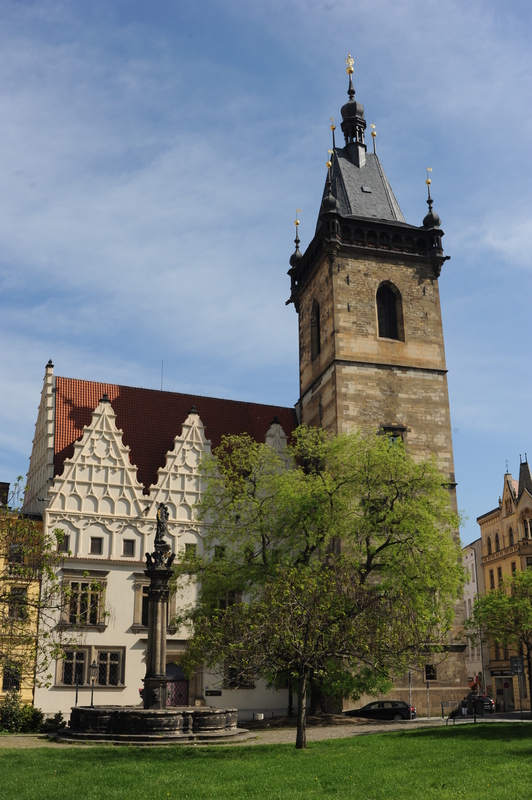 The construction of the town hall started soon after the establishment of the New Town of Prague in 1348. It was the administration centre of the New Town until 1784, when all the four Prague towns were connected. In 1419, it witnessed an armed conflict between the Catholics and the followers of the Communion under both kinds. The procession lead by Jan Želivský and Jan Žižka asked for the release of their imprisoned followers in front of the town hall. Someone from the town hall threw a stone on the procession, and after that the crowd broke inside and threw the burgrave, two aldermen and several burgess representatives out of the windows on the crowd’s spears and partisans. This first Prague’s defenestration on the 30th July 1419 marked the start of the Hussite revolution. In 1609, representatives of the Bohemian nobility met here to force Emperor Rudolf II to issue a decree that would guarantee religious freedoms. The connected Prague towns were administered by the Old Town Hall from 1748 on, and the object of the New Town Hall became the seat of the national criminal court, and also the original town hall prison was extended and started to be called Prague’s Bastila. Two wards of the ground-floor prison are named after their first prisoners Polévka (soup) and Jelito (pork-blood sausage). The leader of the peasant rebellion in South Bohemian district Chodsko, Jan Sladký Kozina, also tried out the local prison, as well as revolutionaries in 1848, and in 1894 there was a process held here in which the members of the progressive youth associated in the Omladina Movement were condemned, for example Alois Rašín or Stanislav Kostka Neumann. 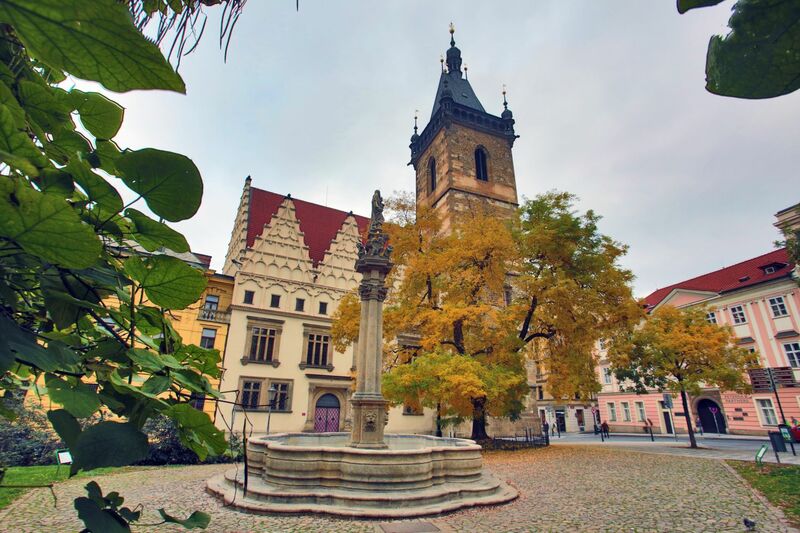 The town hall is a complex of several medieval objects with the oldest Eastern wing dating back to a time around 1377 (facing Vodičkova Street), the Southern wing (facing the square Karlovo náměstí) was added in 1411 - 16, and in the years 1520 - 26 it was rebuilt in Renaissance style and furnished with late-Baroque gables in 1520 - 26 by Benedikt Ried. The Eastern wing was also rebuilt in Renaissance style after 1559 by Bonifác Wohlmut. 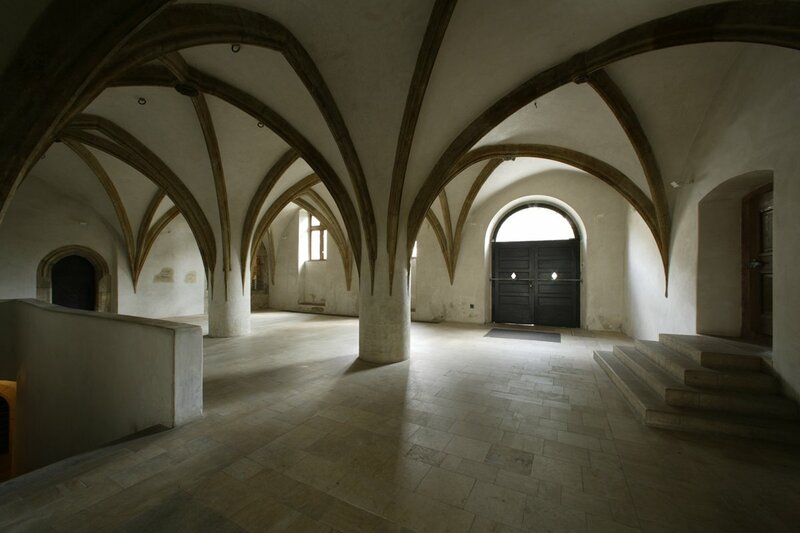 There is a preserved original extensive Gothic two-aisle hall, the town hall Mázhaus (open space on the ground floor) with cross ribbed vaults on cylindrical pillars from 1411 - 18. 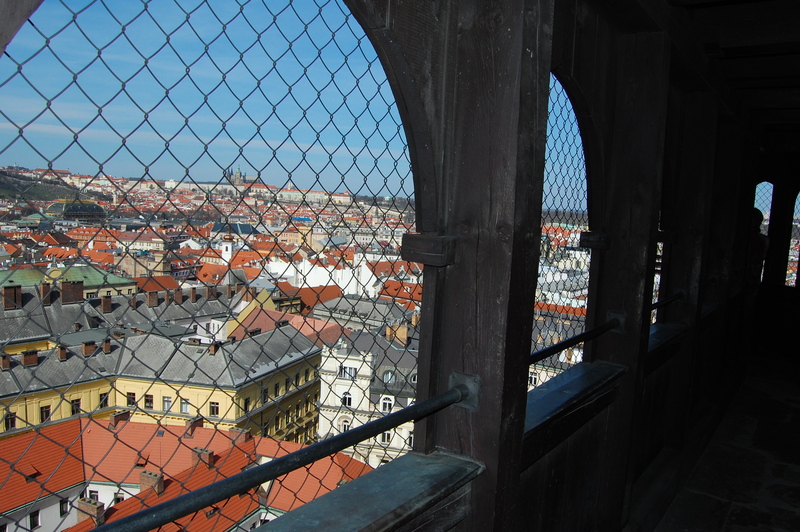 The vault is the highest in Prague, considering civil buildings. The most significant reconstruction of the town hall took place in 1904 - 05, when Antonín Wiehl and Kamil Hilbert abolished the Classicist reconstruction from the early 19th century and returned the building back to its Renaissance appearance from the 1st half of the 16th century. 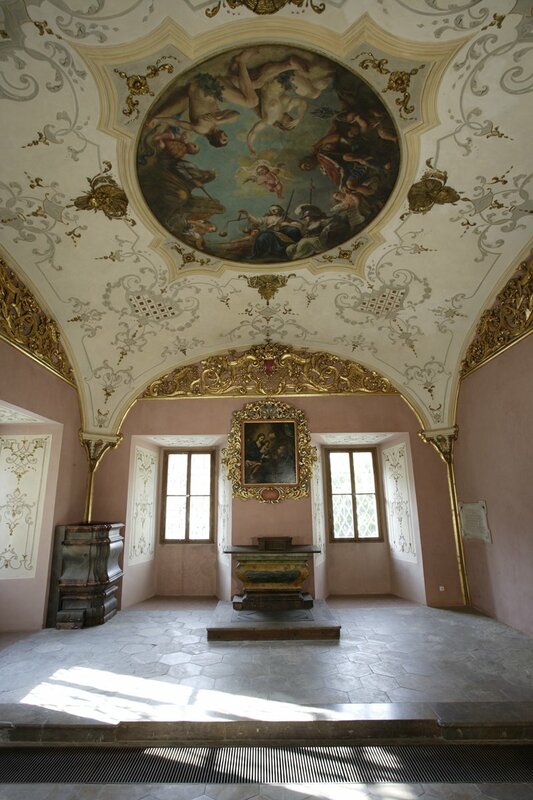 The so called Aldermens‘ Hall (Konšelský sál) is the most extensive hall, on the walls of which there are remains of paintings in the spirit of Rudolphinian Mannerism. From here, the New Town administration was in turns conducted by five councillors. The Gothic corner tower was built in the second half of the 14th century; new Renaissance windows were made in it in the years 1520 - 26; the tower’s gallery and roof date back to 1722 - 25. In 1651, the emblem of the New Town was mounted on the tower; an astronomical clock was painted and installed in 1668, but removed at the end of the 18th century. The quadrilateral tower with four stories is 42 metres high, and there are 221 stairs leading to the top. On the corner, the so called Prague ell (59.14 cm) is installed for the purposes of public measuring. 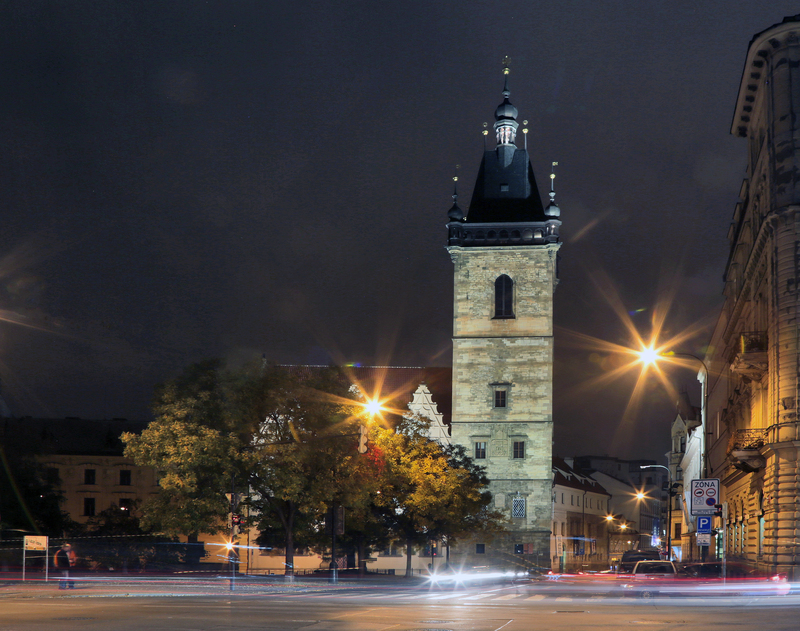 In the tower, there is a chapel that was Gothic originally, but changed in Baroque style in the 1st half of the 18th century, originally consecrated to Virgin Mary and St. Václav. In the chapel, there are paintings of Virgin Mary with St. Benedict (the main altar painting), and St. George and two wooden sculptures of saints. There is a ceiling allegorical fresco of Right and Justice and rich below-ceiling decorations. The last reconstruction took place in 1976 - 96, when the premises were adapted to suit the needs of the Prague 2 Municipal Office. There are premises for exhibitions, concerts and social events. On the first floor above Mázhaus, there is an auditorium with a similar vault, where the wedding hall is located. In 1962, the New Town Hall was declared a national cultural monument.